“Power of the Trinity” born July 23, 1892 – until, was de jure Emperor of Ethiopia from 1930 to 1974 and de facto from 1916 to 1936 and 1941 to 1974. 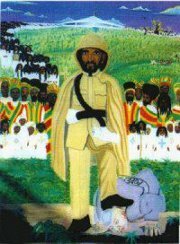 He is also considered to be the religious symbol for God incarnate among the Rastafari movement, founded in Jamaica in the early 1930s. The Rastafari also call Selassie HIM, Jah and Jah Rastafari. The foundation is established to perpetuate and honor the memory of Leonard P. Howell and other brothers and sisters who contributions and achievements have been of enduring value to the development of the Rastafarian Movement in Jamaica and now global (international ). To recognize the contribution of the Howellite’s Community “ Pinnacle” as the first free slaves, united, organized, self developed, economically empowered African Community established in Jamaica. Also, to reclaim and restore a portion of the Pinnacle Property into a UNESCO recognized world heritage site, an international Rastafarian Worship and Research Center and in tribute to and as a monument to Leonard Percival Howell.